Manute Bol died today. He was 47 years old. He spent 10 seasons in the NBA with Washington, Golden State, Philadelphia and Miami. He was dedicated to humanitarian work in Africa and was in the process of trying to build schools throughout Sudan. Bol died at the University of Virginia Hospital in Charlottesville, where he was being treated for severe kidney trouble and a painful skin condition. 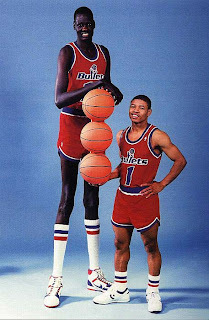 He is pictured at right with Washington Bullets teammate Mugsy Bogues. Bogues is a Wake Forest alum (my alma mater) and he would get us passes to basketball games on occassion. Frank Johnson played with the Bullets then too (another Wake alum - we lived in the same apartment complex near the Capital Centre).